Don’t worry if this doesn’t make sense yet, it should by the end of the chapter! 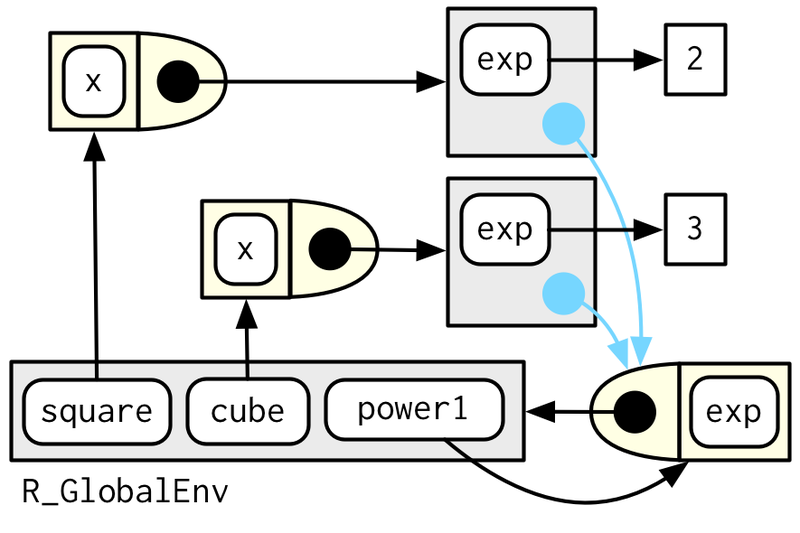 I’ll call square() and cube() manufactured functions, but this is just a term to ease communication with other humans: from R’s perspective they are no different to functions created any other way. In Section 6.2.3, you learned about R’s first-class functions. In R, you bind a function to a name in the same way as you bind any object to a name: with <-. In Section 7.4.2, you learned that a function captures (encloses) the environment in which it is created. In Section 7.4.4, you learned that a function creates a new execution environment every time it is run. This environment is usually ephemeral, but here it becomes the enclosing environment of the manufactured function. In this chapter, you’ll learn how the non-obvious combination of these three features leads to the function factory. You’ll also see examples of their usage in visualisation and statistics. Of the three main functional programming tools (functionals, function factories, and function operators), function factories are the least used. Generally, they don’t tend to reduce overall code complexity but instead partition complexity into more easily digested chunks. Function factories are also an important building block for the very useful function operators, which you’ll learn about in Chapter 11. Section 10.2 begins the chapter with an explanation of how function factories work, pulling together ideas from scoping and environments. You’ll also see how function factories can be used to implement a memory for functions, allowing data to persist across calls. 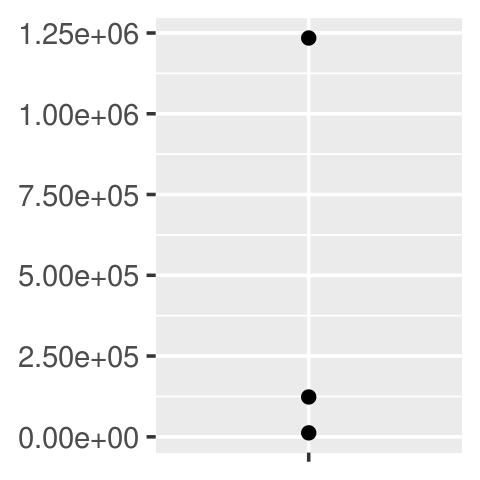 Section 10.3 illustrates the use of function factories with examples from ggplot2. You’ll see two examples of how ggplot2 works with user supplied function factories, and one example of where ggplot2 uses a function factory internally. Section 10.4 uses function factories to tackle three challenges from statistics: understanding the Box-Cox transform, solving maximum likelihood problems, and drawing bootstrap resamples. Section 10.5 shows how you can combine function factories and functionals to rapidly generate a family of functions from data. Make sure you’re familiar with the contents of Sections 6.2.3 (first-class functions), 7.4.2 (the function environment), and 7.4.4 (execution environments) mentioned above. 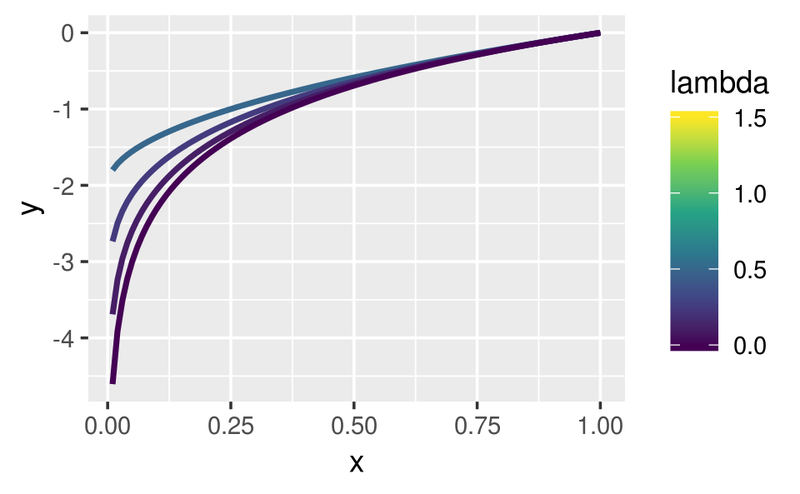 Function factories only need base R. We’ll use a little rlang to peek inside of them more easily, and we’ll use ggplot2 and scales to explore the use of function factories in visualisation. The enclosing environment of the manufactured function is an execution environment of the function factory. It only takes few words to express these big ideas, but it takes a lot more work to really understand what this means. This section will help you put the pieces together with interactive exploration and some diagrams. 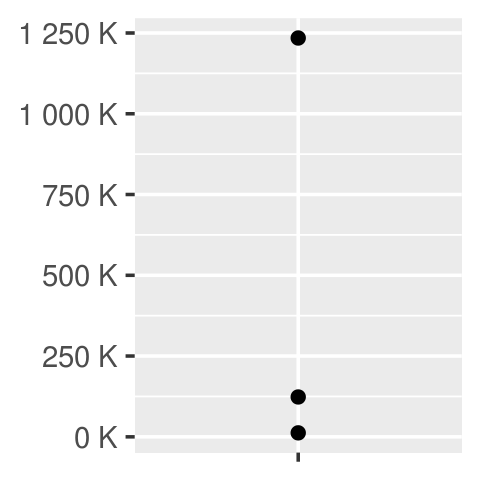 It’s obvious where x comes from, but how does R find the value associated with exp? Simply printing the manufactured functions is not revealing because the bodies are identical; the contents of the enclosing environment are the important factors. We can get a little more insight by using rlang::env_print(). That shows us that we have two different environments (each of which was originally an execution environment of power1()). The environments have the same parent, which is the enclosing environment of power1(), the global environment. This is what makes manufactured functions behave differently from one another: names in the enclosing environment are bound to different values. Any free floating symbol lives in the global environment. Any environment without an explicit parent inherits from the global environment. This view, which focuses on the environments, doesn’t show any direct link between cube() and square(). 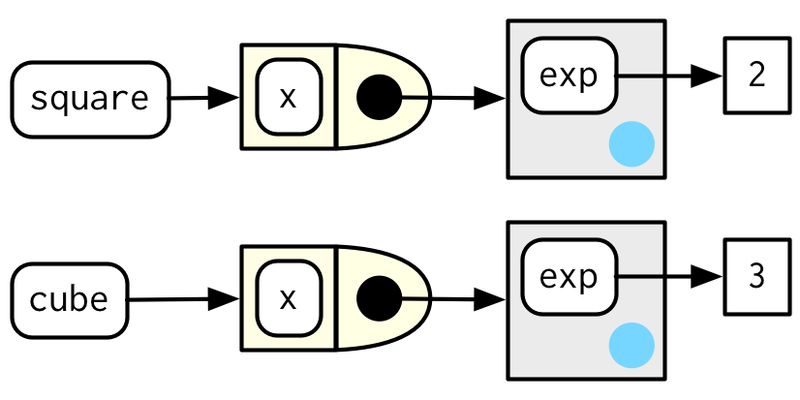 That’s because the link is the through the body of the function, which is identical for both, but is not shown in this diagram. To finish up, let’s look at the execution environment of square(10). When square() executes x ^ exp it finds x in the execution environment and exp in its enclosing environment. Unfortunately it doesn’t because x is only evaluated lazily when square() is run, not when power1() is run. In general, this problem will arise whenever a binding changes in between calling the factory function and calling the manufactured function. This is likely to only happen rarely, but when it does, it will lead to a real head-scratcher of a bug. Whenever you create a function factory, make sure every argument is evaluated, using force() as necessary if the argument is only used by the manufactured function. Function factories also allow you to maintain state across function invocations, which is generally hard to do because of the fresh start principle described in Section 6.4.3. The enclosing environment of the manufactured function is unique and constant. R has a special assignment operator, <<-, which modifies bindings in the enclosing environment. The usual assignment operator, <-, always creates a binding in the current environment. The super assignment operator, <<- rebinds an existing name found in a parent environment. Stateful functions are best used in moderation. As soon as your function starts managing the state of multiple variables, it’s better to switch to R6, the topic of Chapter 14. Why is it better to force(x) instead of just x? Base R contains two function factories, approxfun() and ecdf(). Read their documentation and experiment to figure out what the functions do and what they return. Create a function pick() that takes an index, i, as an argument and returns a function with an argument x that subsets x with i. What happens if you don’t use a closure? Make predictions, then verify with the code below. What happens if you use <- instead of <<-? Make predictions, then verify with the code below. We’ll begin our exploration of useful function factories with a few examples from ggplot2. 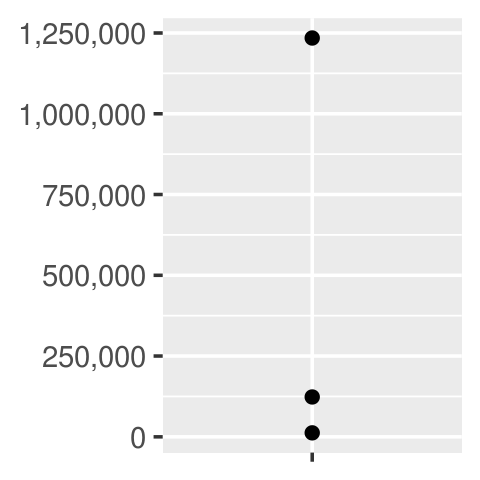 One of the goals of the scales package is to make it easy to customise the labels on ggplot2. It provides many functions to control the fine details of axes and legends. The formatter functions42 are a useful class of functions which make it easier to control the appearance of axis breaks. The design of these functions might initially seem a little odd: they all return a function, which you have to call in order to format a number. 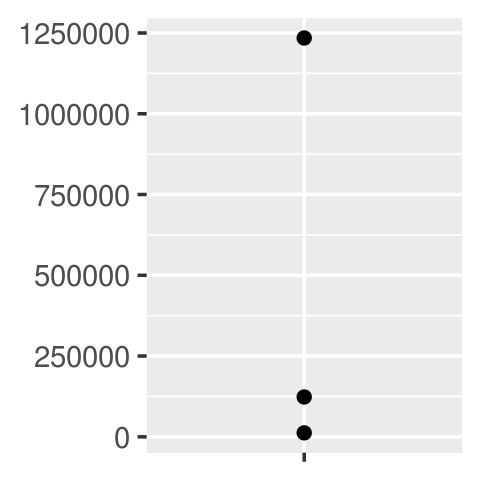 #>  "12 K"    "123 K"   "1 235 K"
A little known feature of geom_histogram() is that the binwidth argument can be a function. This is particularly useful because the function is executed once for each group, which means you can have different binwidths in different facets, which is otherwise not possible. To illustrate this idea, and see where variable binwidth might be useful, I’m going to construct an example where a fixed binwidth isn’t great. Most have filename as first argument but some have file. The width and height of raster graphic devices use pixels units by default, but the vector graphics use inches. horizontal = FALSE, paper = "special"
All of these examples can be tackled without function factories, but I think function factories are a good fit for these problems and provide elegant solutions. These examples expect some statistical background, so feel free to skip if they don’t make much sense to you. In general, this allows you to use a Box-Cox transformation with any function that accepts a unary transformation function: you don’t have to worry about that function providing ... to pass along additional arguments. I also think that the partitioning of lambda and x into two different function arguments is natural since lambda plays quite a different role than x.
I use rm(mod) because linear model objects are quite large (they include complete copies of the model matrix and input data) and I want to keep the manufactured function as small as possible. The log turns a product into a sum, which is easier to work with. Multiplying small numbers yields even smaller numbers, which makes the floating point approximation used by a computer less accurate. We can now turn this function into an R function. The R function is quite elegant because R is vectorised and, because it’s a statistical programming language, R comes with built-in functions like the log-factorial (lfactorial()). We can use lprob_poisson() to compute the (logged) probability of x1 for different values of lambda. So far we’ve been thinking of lambda as fixed and known and the function told us the probability of getting different values of x. But in real-life, we observe x and it is lambda that is unknown. The likelihood is the probability function seen through this lens: we want to find the lambda that makes the observed x the most likely. 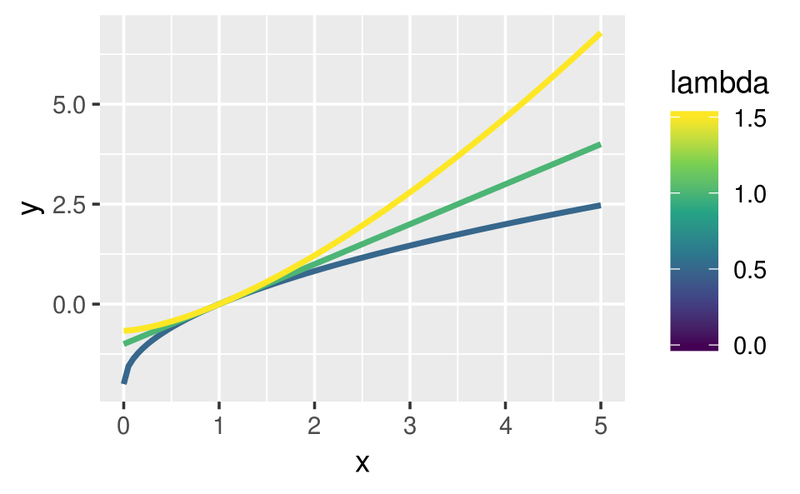 That is, given x, what value of lambda gives us the highest value of lprob_poisson()? One nice thing about this approach is that we can do some precomputation: any term that only involves x can be computed once in the factory. This is useful because we’re going to need to call this function many times to find the best lambda. We can precompute some values in the factory, saving computation time in each iteration. The two-level design better reflects the mathematical structure of the underlying problem. These advantages get bigger in more complex MLE problems, where you have multiple parameters and multiple data vectors. In boot_model(), why don’t I need to force the evaluation of df or model? Why might you formulate the Box-Cox transformation like this? Why don’t you need to worry that boot_permute() stores a copy of the data inside the function that it generates? How much time does ll_poisson2() save compared to ll_poisson1()? Use bench::mark() to see how much faster the optimisation occurs. How does changing the length of x change the results? This idea extends in a straightforward way if your function factory takes two (replace map() with map2()) or more (replace with pmap()) arguments. I recommend this because it makes it very clear when code is being executed in a special context and what that context is. You’ve probably been told to avoid using attach(), and that’s generally good advice. However, the situation is a little different to the usual because we’re attaching a list of functions, not a data frame. It’s less likely that you’ll modify a function than a column in a data frame, so the some of the worst problems with attach() don’t apply. You can later unbind those same names, but there’s no guarantee that they haven’t been rebound in the meantime, and you might be deleting an object that someone else created. You’ll learn an alternative approach to the same problem in Section 19.7.4. Instead of using a function factory, you could construct the function with quasiquotation. This requires additional knowledge, but generates functions with readable bodies, and avoids accidentally capturing large objects in the enclosing scope. We use that idea in Section 21.2.4 when we work on tools for generating HTML from R.
Which of the following commands is equivalent to with(x, f(z))? Compare and contrast the effects of env_bind() vs. attach() for the following code.